Colorful interiors are often lighthearted spaces, defined by a sense of playfulness and surprise. But colors can be an excellent way to bring order to a space by dividing it chromatically. 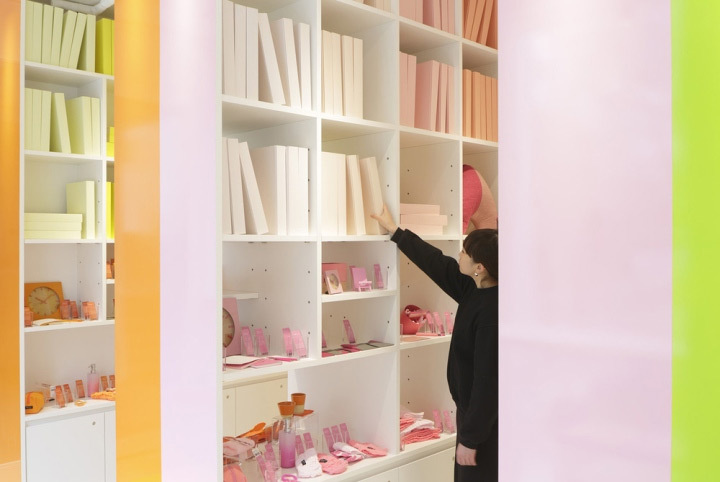 The CORAZYs store in Tokyo, Japan, is a beautiful example of using the visual power of colors to create a well-organized interior. The store is indeed as well organized as one would expect from a library. 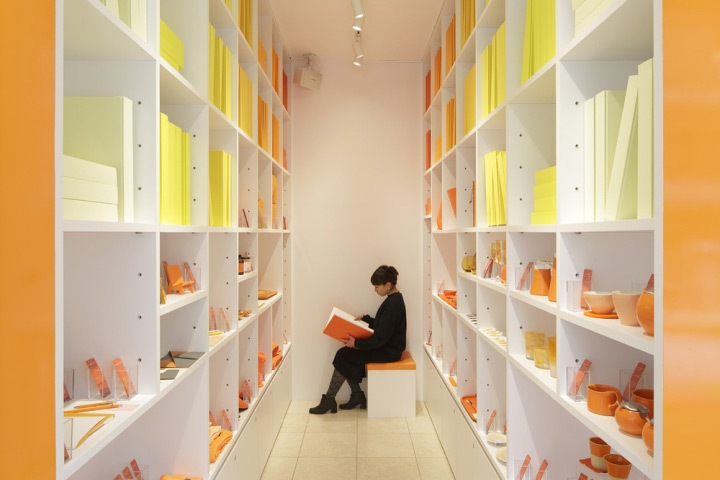 In fact, the library metaphor is the one which lies behind Emmanuelle Moureaux’s design. The tall “bookcases” that hold the products on display are reminiscent of the ones usually found in libraries. Taking the idea down to the finest details, books are displayed on the shelves, next to the store’s products. CORAZYs products are centered around four colors: orange, pink, green and blue. 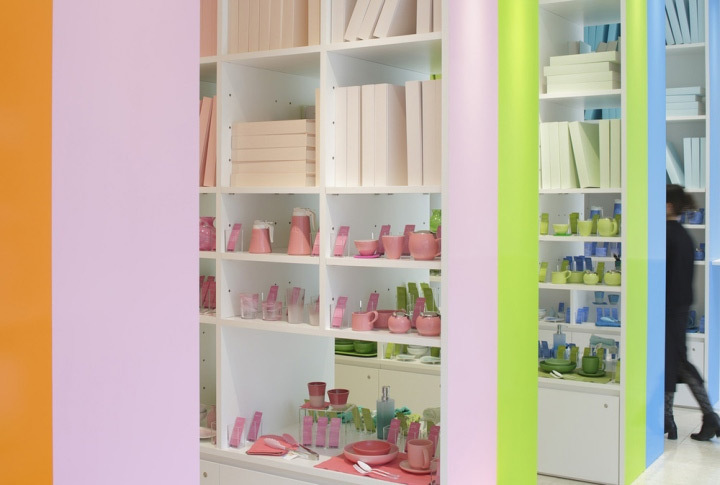 If displaying the items by color is a much used system in home decor stores, CORAZYs takes it a step forward and gives the shelves (and books) themselves the color treatment. 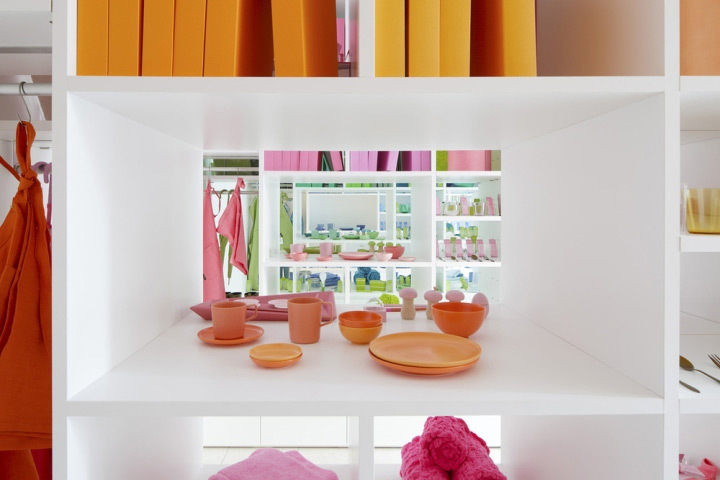 The result is not only a space where customers can easily find what they need, but an integrated arrangement in which the products do not just lie on a random shelf, but become part of the design. While the store looks colorful from outside, giving potential customers a taste for what CORAZYs has to offer, the interior is clean, fresh and airy. The soft contrast between the white background and the colored shelves creates a feeling well-suited to the library metaphor. This is a place of relaxation, yet full of color, mysteries waiting to be revealed and hidden stories. The library idea was meant to help create a place where customers would feel as secure, relaxed and curious as when looking for their next reading adventure on the shelves of a library. It is an attractive concept, subtly inviting those who step in to come back and discover more.